Aiga, Ethiopia- A Living Monument of Courage! 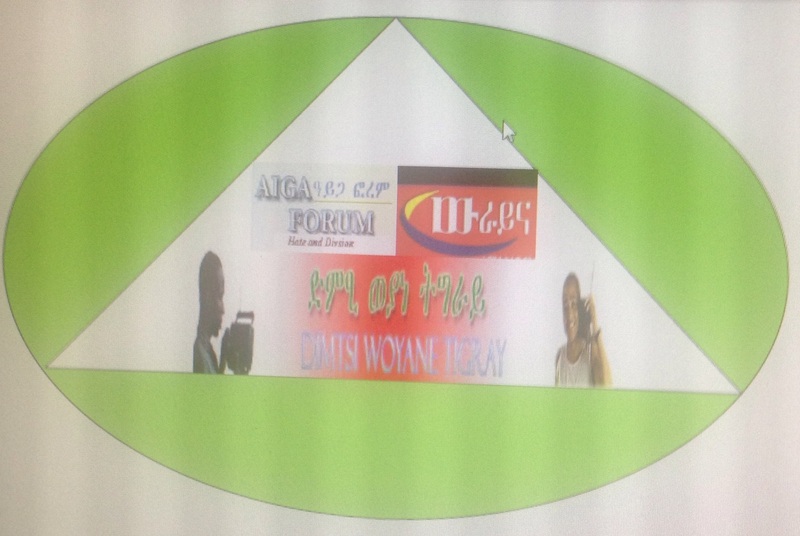 Aiga Forum, an Ethiopian forum for news and views promoting Ethiopia's Unity in Diversity! (Aigaforum) Sep 09, 2017 - In an exclusive Interview with Aigaforum Ato Meles Alem, Foreign Ministry Spokesperson wished a happy and prosperous Ethiopia's 2010 New Year for all Ethiopians! Answering to questions raised, Ato Meles explained the status of Saudi Arabia returnees and the government effort to settle them, on the success and meaning of Ethiopia "kefeta" as well as on Ethiopia's policy towards Eritrea. He also elaborated what Ethiopia's role as member and as current chairperson of the UNSC means to Ethiopia and Africa! Ato Meles also said, the government effort to organize and reach the wide diaspora community all over the world has been satisfactory and sees no immediate change coming! (Aigaforum) August 13, 2017 - Eyasu Tesfay Abraha, TPLF Bureau Deputy Director, explains what EPRDF's Deep Tehadso/Renaissance/ is and the progress made so far. Answering if and when the public will see those responsible for last year's mayhem in the country Eyasu said those responsible will be held accountable. In fact, he said, the recent anti corruption move by the government and the Ethiopian Human Right Report is part of the process. Eyasu also said the fight against narrow nationalism, Chauvinism and rent seeking tendencies will continue. Eyasu also said, as far as TPLF, the country's policy on Eritrea has been working and sees no change coming but he said it is Federal issue not a TPLF or Tigrai issue. (Aigaforum) August 10, 2017 - In an exclusive interview with Aigaforum and her first ever media interview since she left TPLF, Yewebmar reminiscence her gedli times as a fighter, her take on TPLF and democracy then and now, and her early days experience as a women rights activist. Yewebmar also shared her last days experience as a TPLF member and government official. (Aigaforum) August 06, 2017 - Dr Tadele current Tigrai Development Association International Director was gracious enough to sit down for over the phone interview with us. Dr Tadele came to the USA for TDA North America annual conference where he presented a detailed progress report and road map for TDA. He said Kelamino special high school is expanding and increasing its admission of students! TDA is also working to improve quality of education at the high school level.Dr Tadele in no uncertain term said there is no undue pressure from any politician on its day to day operation. He said TDA gets its funds from three sources namely: International donors, Members and Income generating business entities. Dr Tadele said he is ready and willing to meet all Development and Alumni Associations to discuss on any issue they may have! (Aigaforum) July 25, 2017 - Dr Teshome was gracious enough to do an interview with us over the phone from his Addis Ababa office. Dr Teshome explained the need to overhaul the tax collection system in Oromia and the difficulties officials are facing implementing a fair and progressive tax system. He acknowledge the problem with collecting taxes from small business owners and traders but maintained the regional government needs to collect more tax revenue in order to balance its budget and implement its projects. He also explained the thinking behind the economic revolution currently underway and the issue with foreign companies like Dangote which operates a huge industrial complex in the region! (Aigaforum) July 11, 2017 - Interview with Bitew Belay one of the organizers of Adwa Pan African University(APAU). Bitew explained what the recent AU recognition of the University means to the effort of establishing a University at Adwa. He also explained how the APAU is different from other Pan African Universities in Africa. 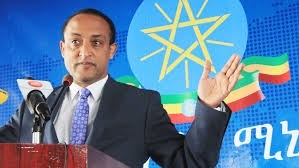 When asked about financing the project as well as sustaining the university once established, he said, thought it will be managed as endowment he is not worried because there is a lot of good will and commitment from known leaders and personalities on top of the commitment of the Ethiopian government. Interview with Social media activist Ztseat(Dr). .
(Aigaforum) June 10, 2017 - Ztseat is a medical lecturer at Mekelle University in Tigrai. Ztseat shared his opinions on federal projects in Tigrai and the problems encountered, on youth migration from Tigrai and on the overall economic and political challenges seen in Tigrai! Ztseat shared his opinion as young educator and from the young generation perspective. The interview was moderated by Addisu Bahta and Isayas Abaye. (Aigaforum) April 8, 2017 - Ethiopia is expected to announce new policy to deal with Eritrea and the one man government of Isaias Afeworki. The foreign ministry has submitted its study on the new policy to the PM Hailemariam. The policy will be presented to the council of ministers soon. We invited Assefa Fiseha (Phd) from Addis Ababa University and Solomon Barnabas (PhD) from Civil Service University to share their opinion and expectation of the new policy and to share their thoughts on the issue(s) the new policy is expected to solve. 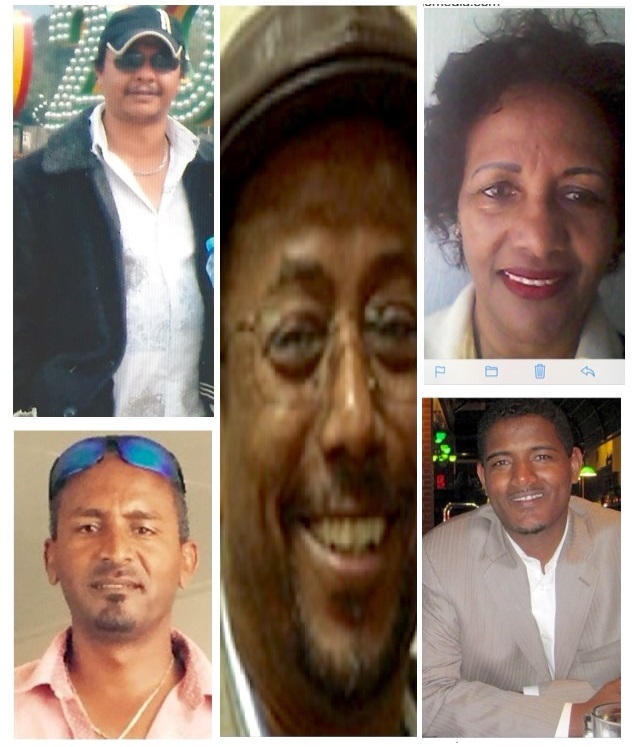 The educators also discussed why the Ethio-Eritrea problem is still unresolved to date! Listen to the informative discussion! 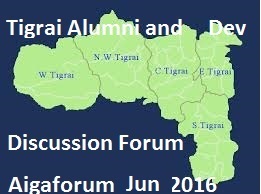 (Aigaforum) June 05, 2016 - In an ongoing effort to transform the many North American Tigrai based regional Almuni and Development Association Aigaforum has held so far two round table discussion via a teleconference. The following is a reportage of the last teleconference we had on June 05, 2016. The discussion was very fruitful and many participants wanted to continue such discussion in the future. The main talking points of the discussion were the success and challenges each Alumni and Development organization faced and how best to transform and organize the Tigrean community towards the development of Tigrai and its people. (Aigaforum March 26, 2016)_ The Ethiopian government policy towards Eritrea has been controversial from the beginning Eritrea was born! 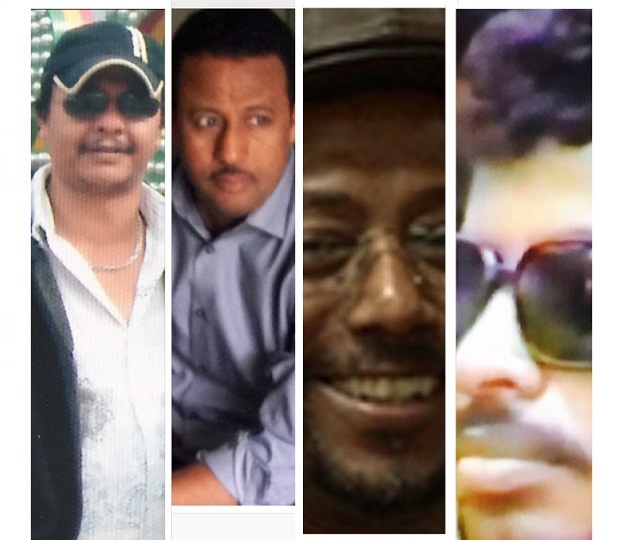 PM Meles government tried to reason with President Isaias to make peace to no avail! In fact when asked, PM Meles said, he did not expect the issue will be resolved in his life time. Perhaps Meles knew his days were numbered due to his illness - blessed his soul! Otherwise it was a surprise to many for him to say as such since he was not known to be a pessimist! Since Yemen became a failed state the geopolitical landscape is changing around the Red Sea area. And it is changing for the worst as far as Ethiopia is concerned! 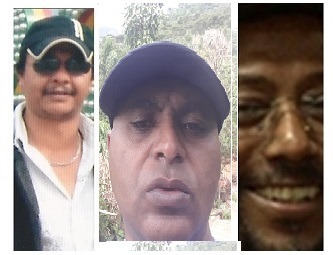 Thus, says Dade Desta, Ethiopia's policy towards Eritrea has to change accordingly. Dade gave an extended interview to Aigaforum moderated by Addisu Bahta to explain his thoughts on this issue. In an ongoing panel discussion on good governance in Ethiopia Aigaforum invited Engineer Almaz Feseha,Kiros Araya and Gebrehiwot Gebreanenia to share their experience and suggestions on ways to improve the good governance issues that are prevailing in Ethiopia. Moderated by Addisu Bahta and Isayas Abaye, the invited guests, explained how technology can help mitigate some of the persisting issues and how urban projects and infrastructure works are managed in the United States. They also shared some of the weakness of some of the government institutions that are contributing to the lack of good governance from first-hand experience! Interview with Ato Asmelash Woldeselassie and Ato Atsbaha Aregawi, Chair and Co-chair of TDVA, following the conference that was held in Mekelle June 2014. They have given detailed explanations on various issues ranging from government�s and EFFORT�s role to Diaspora contributions. They have acknowledged the contributions made by the regional government and the public at-large so far and emphasized on the need for continued support to help the association meet and satisfy the growing demands of our disabled veteran heroes, who made today�s Ethiopia a reality.